Pete asked me what I wanted the signature to say, so I told him…. I grew up watching Pete Rose play baseball. He was Charlie Hustle — a nickname he earned. When the umpire called “Ball four,” Pete didn’t casually stroll down to first base. He ran full-out. Because you never know when you might get a little advantage on the other guys. Pete was an All Star at five different positions. No one else has ever done that. He collected 4,256 hits in his career. No one else has ever done that — and pretty much no one else even has a chance to come close. Getting to the 3,000-hit plateau is a rare accomplishment. Four thousand is basically unthinkable. 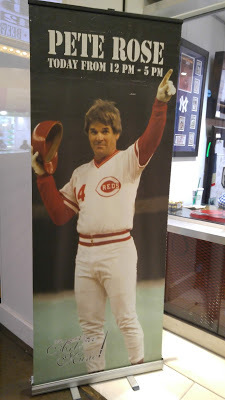 Pete Rose, as you probably all know, was banned from baseball for life in the late 1980s because he bet on games while still manager of the Cincinnati Reds. And gambling is perhaps the ultimate sin in the eyes of Major League Baseball, even worse than using steroids. Ever since the Black Sox scandal in 1919, MLB has gone to sometimes-extreme lengths to dissociate itself from gambling. In the early 1980s, both Mickey Mantle and Willie Mays, both retired at the time, and both members of the Baseball Hall of Fame, had been banned simply for taking promotional, celebrity spokesperson-type jobs with casinos. If you worked for a casino, no matter in what innocuous capacity, you could not be associated with baseball. Fortunately (and sanely), both Mickey and Willie were later reinstated after they left those positions. So Pete Rose is unable to take any position of employment with Major League Baseball or any of its associated entities. And because the Baseball Hall of Fame has ruled that anyone banned from baseball is also ineligible to be elected to the Hall of Fame, the game’s greatest hitter of all time — and arguably the greatest player of all time, who holds a couple dozen all-time MLB records — is not honored with baseball’s highest honor. That is a travesty, pure and simple. A hall of fame does not exist to pass judgment on a player’s off-field activities. A hall of fame exists to honor on-field accomplishments. Few players have accomplished as much on a baseball field — ever — as Pete Rose. Pete Rose belongs in the Baseball Hall of Fame. There. I’ve said my piece. And I am far from alone in that opinion. But, more to the point…. 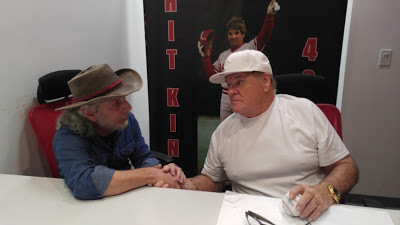 Pete Rose nowadays lives in Las Vegas and earns a tidy sum of money selling autographed memorabilia to guys like me. Pretty much every day he is at a collectibles shop in one of the Strip casinos for a few hours signing autographs and chatting with fans. You can find his schedule on his website. 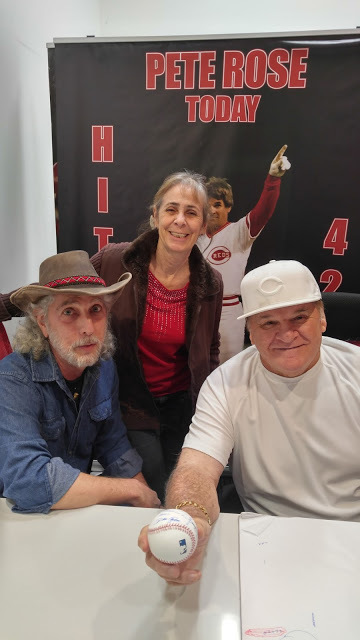 When we went to Vegas in October, 2016, one of the things I wanted to do was to meet Pete and have my picture taken with him. But his schedule was oddly blank for the week we were there. Then one evening, strolling through a casino, I caught a glimpse of a TV broadcasting the World Series. There with the commentators was — Pete Rose. Looks like I picked the wrong week to come to Vegas…. This past month, we went back to Vegas for a few days. And this time, Pete was in town. So I finally got to meet him, have him sign a baseball for me, and have a few pictures taken with him. It was a nice experience. We didn’t spend a lot of time with him. Other people were waiting behind me, and the people ahead of me had sort of monopolized a lot of his time, so I think he was getting a little restless to move on. But he was a good guy, friendly and amiable. I had been trying to think for a couple days of how I might want him to inscribe the baseball I’d have him sign. Finally, the night before, it had come to me. I was hoping he had a good sense of humor…. 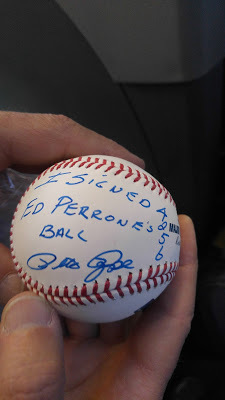 He turned to me, gave a sort of half-grin, and shook his head a little as if he were thinking, “Where do you guys come up with this stuff?” And then he graciously signed my ball for me. I told him I had grown up a Phillies fan, and one of my lasting memories of his career was the day I woke up and saw the newspaper headline which said, in so many words, “Pete Rose Is Now A Phillie.” I couldn’t believe it. First of all, Pete was really Mr. Cincinnati Red. You could never conceive of him leaving the Reds. Yet he did leave the Reds. And when he did — he came to the Phillies! How could we get so lucky? Not long thereafter, of course, came the Phillies’ first World Series championship ever. We chatted a few minutes more, then Pete asked my wife to come back and get in a couple of the pictures as well. Then it was done. Pete Rose. Perhaps the greatest man ever to play the game of baseball. Shunned by officialdom. But many of us know who the real heroes are.